As the NHL season ends for the Canucks, two Canucks begin another hockey season at the World Championships in Mannheim and Cologne, Germany. Christian Ehrhoff travelled to his home country Wednesday following the Canucks exit from the playoffs. 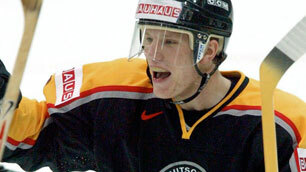 This is Ehrhoff's fourth appearance at the World Championships representing Germany. Earlier this year, he was part of Germany's Olympic ice hockey team. Germany was 1-1-0-1 in the preliminary round and second in group D, which consisted of Finland, Denmark, and USA. The tournament is currently in the qualifying round with 12 teams remaining, reduced from 16 at the start of the tournament. The host country is slotted in group E, currently led by Russia with Germany in second place after the first two games. Germany has three more games to play this round, beginning with their next game against power house Russia featuring NHLers, Alexander Ovechkin and Ilya Kovalchuk and soon to be joined by Sergei Gonchar and Evgeni Malkin. Marcel Goc of the Nashville Predators is the only other German NHL player. While Ehrhoff has plenty of international experience, Mason Raymond is fresh on the world circuit, getting the call to represent Canada for the first time in his hockey career. Hockey Canada announced two additions to their World Championship roster yesterday including Raymond and Oilers goaltender Devan Dubnyk to the roster. Raymond set career bests in all categories with 53 points (25-28-53) in 82 regular season games - 30 points more than his previous best set in the 2008-09 season. He also register three goals and an assist during the playoffs - one point more than last year's playoffs. Team Canada is currently in second place in group F of the qualification round behind Switzerland after the first two games. The team is coached by former Oiler coach, Craig MacTavish and is set to play Norway today. 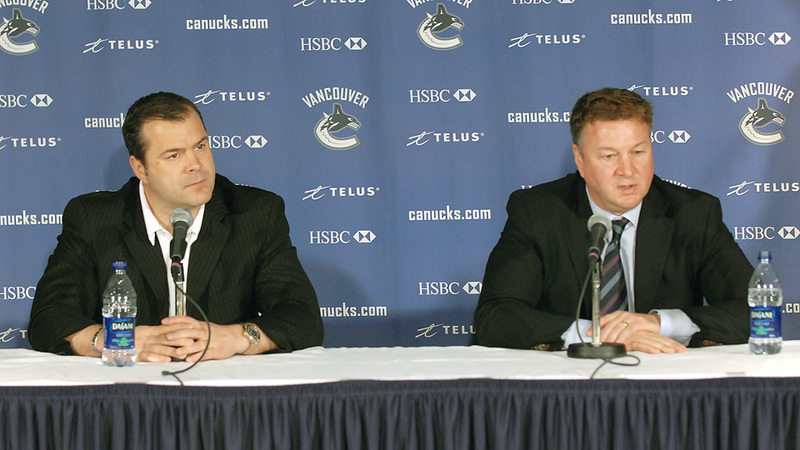 Canucks head coach Alain Vigneault and President & General Manager Mike Gillis spoke to the media today about the end of their season, and what lies ahead for Vancouver. After a disappointing round two loss for the second time against the Chicago Blackhawks, both Vigneault and Gillis will plan on making a few adjustments, none that have yet been decided. The most important aspect to the team is personnel, and having players that will continue to improve and push towards the Stanley Cup. The coaching staff and organization have made steps this season to secure their core players by signing forward Ryan Kesler for another six seasons. What comes next is deciding the future of Canucks free agents, Willie Mitchell, Pavol Demitra, Shane O’Brien, Kyle Wellwood, Ryan Johnson, Mason Raymond, and Jannik Hansen. 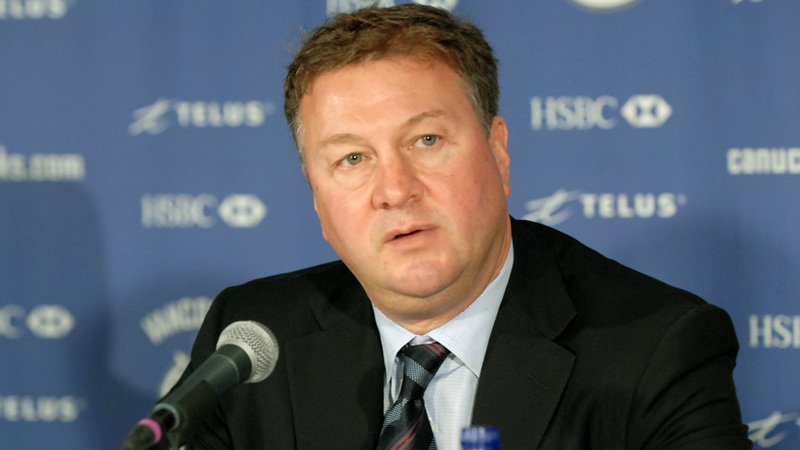 "This summer we have lots of room, we have all our core players signed," said Gillis. "I think when you look at our team, we do constantly need to make improvements but the one thing we need to have happen is that we need some push from younger players that we’ve selected. We haven’t had any player make this team that I’ve selected in the draft to date and that’s where you make real headway." A lot of concern was expressed from the media about the Canucks captain, and whether or not he’d be wearing the ‘C’ next year and continuing to play 60+ games a season with little rest. "We’re going to take our time and like last year, we looked at every possible way to improve," said Gillis. "We’re going to spend some time with Roberto and talk to him about it and that’ll be something that occurs after everyone’s emotions have subsided in the clear light of day and see how he feels about it and we’ll tell him how we feel about it." Luongo did express Thursday that being captain is something he loves. In the past two seasons he’s helped his team win two consecutive Northwest division titles and two third seed spots heading into the playoffs. "Roberto has all of the characteristics of a great captain and leader," said Gillis. "He’s the hardest working guy on the team, he’s the most competitive guy, he takes things to heart, he stands up when he doesn’t feel like he performed well enough, he answers questions, he has all the leadership qualities. Whether there are other factors that are involved that we hadn’t counted on when he was made captain, I don’t know. We’ll take our time, we’ll discuss them and we’ll see how it goes." Vigneault addressed the media about the team’s penalty kill during the post-season, which was the lowest in the league with a 68.5 PK%. After ending the regular season with a much higher 81.6 PK%, allowing 17 power-play goals in 12 playoff games seemed out of character for the team. "That’s one of the questions that we’re trying to answer here in the next while," said Vigneault. "Obviously our penalty killing during the season was good, we were 4th in the NHL, had some issues on the road, but we’re going to have to look at everything from systems to personnel and we’ll do that here in the next little while when we’re a little clear headed." Gillis assured the media that changes and improvements take time, and not to forget the impressive regular season where the Canucks topped the Northwest once again, even after enduring many injuries and the longest road trip in NHL history. "I think that when you look at the regular season, we had players that made really dramatic improvements from our team last year," said Gillis. "I think when you look and it and boil it down, we had players that had career seasons, so I thought we had made really big strides in terms of our performance from the end of the season during the course of this season."